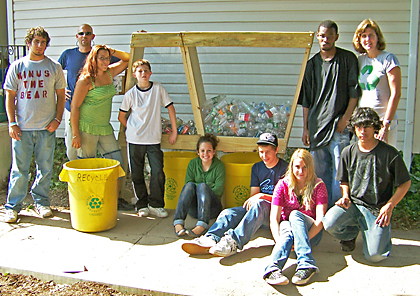 CHANGE CAN HAPPEN: Bridge Academy students take a break from constructing their own recycling center at the school. From left: Max Giaccone, Bridge Academy teacher Scott Fort, Veronica Serrano, Conor Carroll, Chelsea Tuccillo (seated), Buster Bozzi, Christina Spiro, David Goff, Darryl Bathersfield, and teacher Jen Ferri. Take the Princeton Public Library. In 2003, the library closed its temporary branch after its new facility was completed. When it packed up and reopened on Witherspoon Street, some Shopping Center patrons were left feeling a void. Governor Jon Corzine was tapped Tuesday, November 6, to receive the HiTOPS’ 2008 Policy Guardian Award. The announcement was made at the HiTOPS Guardian Award Gala Kick-Off at the facility on Wiggins Street. Ellen Foos has a passion of poetry and for publishing. A production editor for Princeton University Press by day, she moonlights as a small press publisher. To date, her Ragged Sky Press, founded in 1992, has published fiction, nonfiction, and several poetry books, including a set of five by members of the U.S.1 Poets’ Cooperative.